This crusty potato cake is inspired by the one served at L'Ami Louis, a highly regarded Bistro in Paris, France. 2 lbs. Yukon gold potatoes, peeled and cut into ½" x ¼"
1. Put potatoes into a 4-qt. pot and cover by 1" with salted water. Bring to a boil, reduce heat to medium-low, and simmer until potatoes are tender, 20–30 minutes. Drain potatoes, transfer to a baking sheet, and chill. 2. Heat oven to 400°. Melt fat and butter in a 6" cast-iron skillet or ovenproof nonstick skillet over medium heat. Put chilled potatoes into a bowl. Pour fat and butter over potatoes (reserving skillet) and season with salt and pepper; toss to coat. Tranfser potatoes to reserved skillet, cover with a piece of parchment paper cut to ﬁt inside rim of skillet. Cook, smashing potatoes into skillet with a metal spatula, until edges begin to crisp and brown, about 30 minutes. Transfer skillet to oven and bake until potato cake is golden brown, 10–15 minutes (to check, use a fork to lift up one edge of the potato cake). Invert a small serving plate over skillet. Using two tea towels, hold plate and skillet together ﬁrmly and invert skillet. 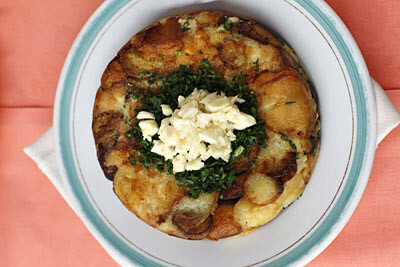 Remove skillet and garnish potato cake with parsley and garlic. Serve hot.